It's on a harbor island a short ferry ride from Market Square. You can explore this stone-walled, 18th-century fortification and its rooms on your own, but I recommend a guided tour. It will enrich your experience and knowledge of this historic stronghold. Helsinki has two. 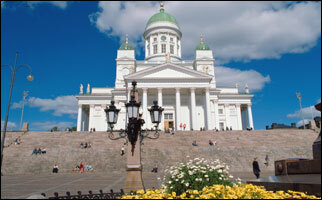 One is the Helsinki Cathedral (see photo). It sits high on a hill, dominating the city's skyline. The other does the opposite. It hides underground. The Church of the Rock was built into solid rock. The first is an open-air market flooded with vendor stands offering a wide variety of fruits, vegetables, fish, crafts, and souvenirs. Nearby is indoor Old Market Hall, known for its local Finnish food specialties like reindeer sausages and smoked herring.